Sure, vinyl lettering has revolutionized the motorsports industry, but for a classic vehicle, nothing looks more appropriate than real painted lettering. When it came to getting our classic shop truck project vehicle properly lettered for our upcoming Mitty event, we weren’t going to settle for vinyl. Sure, vinyl lettering has revolutionized the motorsports industry, but for a classic vehicle, nothing looks more appropriate than real painted lettering. Fortunately, during this year’s Daytona Bike Week we ran into longtime racer, Classic Motorsports reader and vintage racer Russ Mowry. On weekends, as part of his Gray Beard Racing team, Russ can be found racing his 1959 Elva Courier with VSCCA and SVRA. During the week, however, Russ is a real, old-fashioned sign painter and owner of Graybeard Design: (603) 738-7313. Based out of New Hampshire for most of the year and Florida when he needs a break from the cold winter, we can recommend Russ for lettering work. We were thrilled at how he duplicated our intricate logo and painted it on both sides of our 1963 Ranchero. Russ was also very reasonably priced and did the whole job in just a few hours. Great to see some custom work , the vinyl cutter has been laying waste to artist and signpainters . 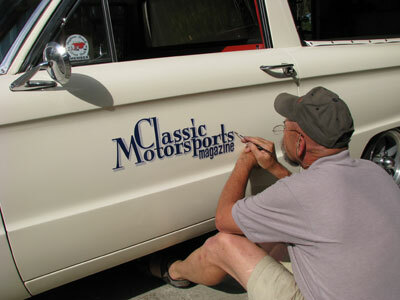 THe great thing about custom lettering is thats the way it was done back in the day when the ranchero was new . Good job guys . Yeah, thanks, I just couldn't go with vinyl on this one. It just would not have looked right. The best part about a hand-painted logo is that it will look even better when it's half worn off. Man, that's some nice work.